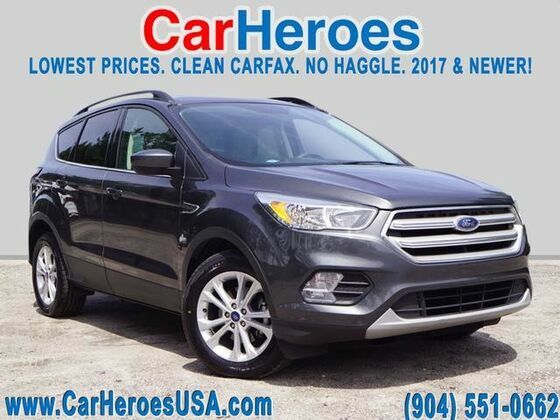 CarHeroes is honored to present a wonderful example of pure vehicle design... this 2018 Ford Escape SE only has 42,571mi on it and could potentially be the vehicle of your dreams! This Ford includes: ENGINE: 1.5L ECOBOOST 4 Cylinder Engine Gasoline Fuel Turbocharged CHARCOAL BLACK, HEATED UNIQUE CLOTH FRONT BUCKET SEATS Cloth Seats Rear Bench Seat Power Driver Seat Driver Adjustable Lumbar Pass-Through Rear Seat Bucket Seats MAGNETIC METALLIC PANORAMIC VISTA ROOF Panoramic Roof Generic Sun/Moonroof Sun/Moonroof Dual Moonroof *Note - For third party subscriptions or services, please contact the dealer for more information. * When you purchase a vehicle with the CARFAX Buyback Guarantee, you're getting what you paid for. This Ford Escape SE defines excellence in an SUV. It has the convenience of limitless boundaries paired with city sophistication. Just what you've been looking for. With quality in mind, this vehicle is the perfect addition to take home. **To receive the lower advertised price or Preferred Payment discounted price purchaser must purchase the vehicle using one of the following preferred payment methods: Cash, Cashiers Check without lien recording instructions, or Financing through the dealership with an Approved lender. **YOU MAY CONTACT THE DEALERSHIP FOR A LIST OF APPROVED LENDERS**. A list of approved lenders maybe requested by email or talk to a sales representative. If buyer is purchasing the vehicle using any other payment method ORIGINAL price will apply. **All Truecar price certificates will reflect ORIGINAL price** All prices advertised on any Credit union or third party lenders buying service facilitated by third party websites are original prices and not the discounted price. Customer may choose to receive the discounted price if they pay for the vehicle with a preferred payment method. Radio: AM/FM Stereo w/Single-CD/MP3 Player -inc: 6 speakers speed compensated volume and SiriusXM radio w/a 6 month prepaid subscription Note: SiriusXM audio and data services each require a subscription sold separately or as a package by Sirius XM Radio Inc If you decide to continue service after your trial the subscription plan you choose will automatically renew thereafter and you will be charged according to your chosen payment method at then-current rates Fees and taxes apply To cancel you must call SiriusXM at 1-866-635-2349 See SiriusXM Customer Agreement for complete terms at www.siriusxm.com All fees and programming subject to change Sirius XM and all related marks and logos are trademarks of Sirius XM Radio Inc SiriusXM service is not available in Alaska and Hawaii.